Located 7km to the West of Malaga Airport is the first of the Western resorts, not only being first in terms of location, but Torremolinos was the first resort to be developed back in the 1960's. Torremolinos has grown and grown over the years and has outgrown its previous image as a typically English resort into an aesthetically appealing resort with a more Spanish feel renown for its clean sandy beaches, fine selection of local cuisine, wide choice of hotels/apartments and a variety of activities suitable for all ages. Due to the Sierra de Mijas mountains which protect the coast from cold northerly winds, Torremolinos has a fantastic climate year round. During the summer months Torremolinos has great appeal to the younger generations, with a reputation for a great night-life, whether it be down at the beach bars in Los Alamos, or the busy centre bars which have a slightly different appeal; Torremolinos centre at night is renown in the gay community. During the winter months however the resort takes on a slower pace and appeals to couples and the older generation. 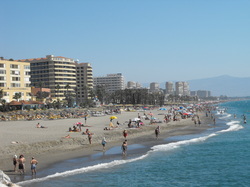 Over the years the area has developed and part of this development is the 'Paseo Maritimo', starting from the area of Los Alamos the Paseo Maritimo stretches along the entire coastline of Torremolinos, until you reach the start of Benalmadena where it continues on past the Puerto Marina of Benalmadena. To the east of the town centre lies the areas of Los Alamos and Playamar. Los Alamos and Playamar have several hotels mostly located right on the Paseo, the beaches are well maintained and are usually very busy in the summer months with local Spanish families/friends creating a friendly atmosphere. Los Alamos and Playamar are easily accessible, whether you decide to stroll along the Paseo from Benalmdena or La Carihuela, or you be decide, if you are coming from further down the coast, to use the convenient train and alight at either Los Alamos or La Colina train station, both just a short stroll from the sea front. During the winter months, if you look out towards Los Alamos, you will see the sky full of kites, as the beaches in this area are popular with kite surfers. Further on you will reach the area of El Bajondillo. Up from the beach of El Bajondillo, you can meander your way up through the old fishing village towards the town centre. The steep steps wind there way up, passing little boutique shops, several bars until you reach the bottom of Calle San Miguel (San Miguel Street). Calle San Miguel is a well paved pedestrianised shopping street running through the centre of Torremolinos, with little alleyways and Plazas (squares) running of from the main street, it is a great place to pick up some souvenirs, clothes, jewellery or to just sit back and grab a drink and a snack. The train station of Torremolinos is found in a Plaza just off of Calle San Miguel. Coming back down to the sea front, you can continue along the Paseo Maritimo, round the headland through to La Carihuela. As you stroll around the headland, take a moment to relax and admire the great views over to Malaga in the East or Benalmadena Marina to the West. La Carihuela is an old fishing village with a charming Spanish atmosphere, as you wonder through the back streets you will see many of the original Spanish houses, then wonder down the small alleyways and main street with the little souvenir shops. Back on the paseo, you will see an abundance of little bars, restaurants and chirinquitos (beach bars) serving up great samples of locally prepared sea food.